We are a wee bit obsessed with lettuce wraps. Low carb, fun and easy to prepare — what’s not to love? The orange infused hoisin is such a simple joy. This is one of the freshest, cleanest tasting dishes we’ve enjoyed in a while, so it bears hoarding. 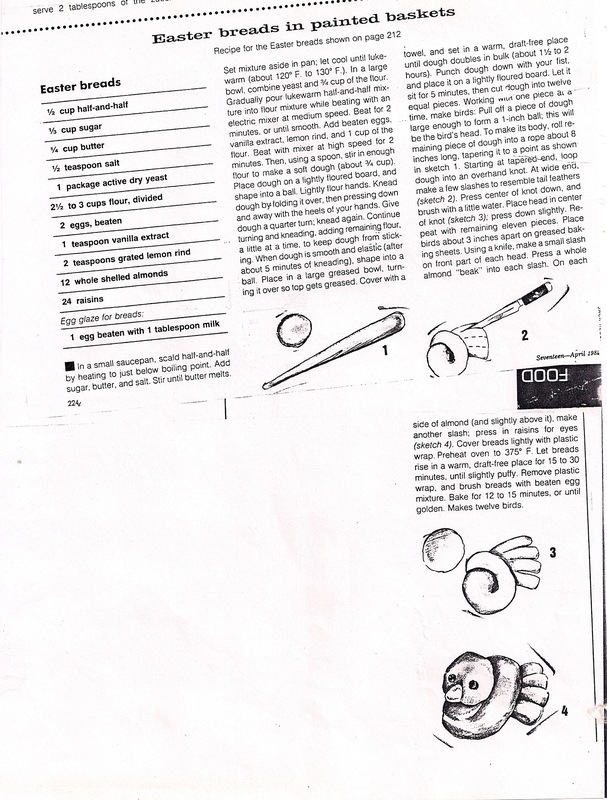 At bottom is another lettuce wrap clipping we’ve kept through the years: Martin Yan’s minced poultry with walnuts. Stir sauce ingredients together and reserve. Whisk soy sauce, chili sauce, cornstarch, water and sesame oil together and add to turkey. Stir one minute. Add cilantro, mint and green onions. Soak mushrooms in warm water to cover until softened, about 20 minutes; drain, reserving 1/4 cup (50 ml) of the soaking liquid. Discard stems and chop caps. Spread walnuts in a pie pan; toast in a 350 degreesF (180 degreesC) oven, stirring once or twice, until lightly browned, about 10 minutes. Let nuts cool, then coarsely chop. Cut chicken into 1/4-inch pieces. Place in a bowl with oyster-flavoured sauce; stir to coat. Let stand for 10 minutes. Place a wok over high heat until hot. Add oil, swirling to coat sides. Add ginger and cook, stirring, until fragrant, about 10 seconds. Add chicken and stir-fry for 1 minute. Add carrot, zucchini and water chestnuts; stir-fry for 30 seconds. Add reserved mushroom soaking liquid; cook until vegetables are tender-crisp, about 2 minutes. Add wine and sesame oil; cook until heated through. Add walnuts and toss to coat. To eat, spread hoisin sauce on a lettuce cup, spoon in some of the chicken mixture, wrap in lettuce cup and eat out of hand. In our never-ending quest to plan and pack the perfect lunch, this healthy veggie chili really fits the bill. Nothing new about veggie chili, but we found Gwyneth Paltrow’s combination and proportion of the beans and lentils very pleasing. I also sprinkled cornmeal and shook in some soy sauce at the end, because although the cooked veggies tasted great, it was a little flat for my taste. A big handful of crushed tortilla chips was tossed in at the last minute and I won’t say it was a mistake. The whole batch of chili filled seven lunch containers of over 1 cup each. Straight into the freezer, and you won’t worry about making lunch! Heat the olive oil in a medium soup pot over medium heat. Add the onion, carrot, bell pepper, garlic, chili powder, cumin, and black pepper. Cook, stirring, for 15 minutes, or until the vegetables are softened. Add the chipotle and stir to combine. Turn the heat up to high, add the tomatoes and their juice, crushing them a bit with your wooden spoon, and bring to a boil. Reduce the heat to low and simmer for 40 minutes. Add the lentils and beans. Fill one 14-ounce can with water and add it to the pot, along with the salt. Bring to a boil, lower the heat, and simmer for 40 minutes. 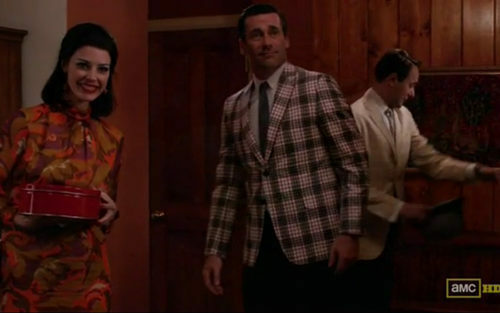 More from the Mad Men food front. Loving that Megan Draper brought along a signature fire-engine red cannister of brownies from William Greenberg Desserts to Pete and Trudy’s suburban dinner party. And that Pete gamely insisted: “Can we put them in the ice box? Can everyone try it my way?” Such a simple, decadent pleasure. See that recipe at bottom. 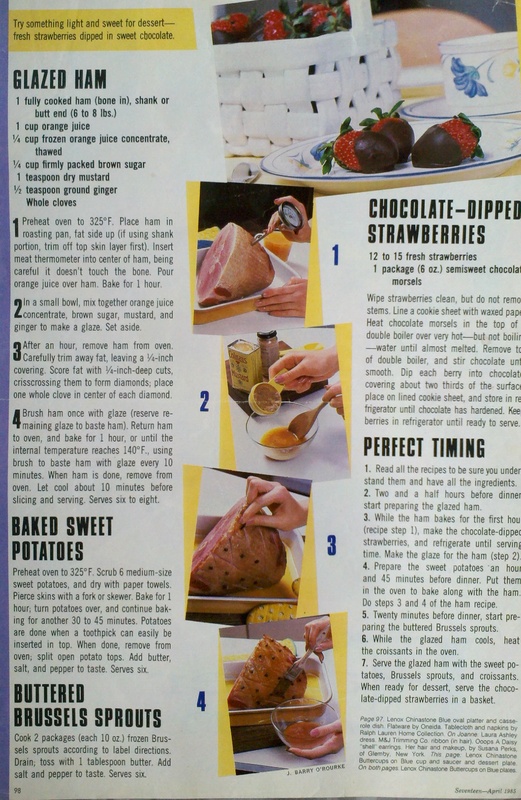 Another recipe for WGB brownies comes from the “Loaves and Fishes Cookbook” by Devon S Fredericks & Susan Costner 1980. In a large mixing bowl, beat eggs with electric mixer until light. Slowly beat in sugar. Beat for about a minute or until light and fluffy. Beat in vanilla. Slowly add melted chocolate to sugar mixture. By hand, stir in flour mixture. Pour into pan and bake for 20-22 minutes – no longer. 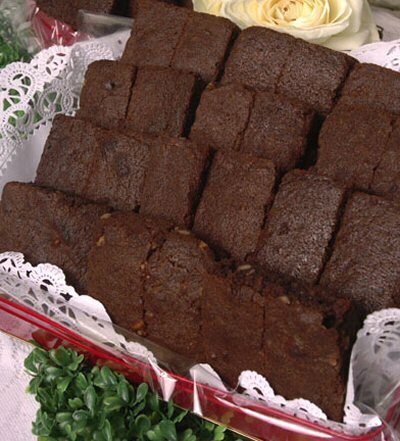 Brownies will cook as they stand. Let cool completely, then chill for a few hours. Remove parchment from pan. Place on a cutting board and cut into large squares. Mix flour and soda. Cream butter and sugar; add egg, chocolate and the milk alternately with the flour mixture. Grease small timbale moulds; place one teaspoon full of the mixture in each and bake in a moderate oven 10 to 15 minutes. Makes 60 little cakes. 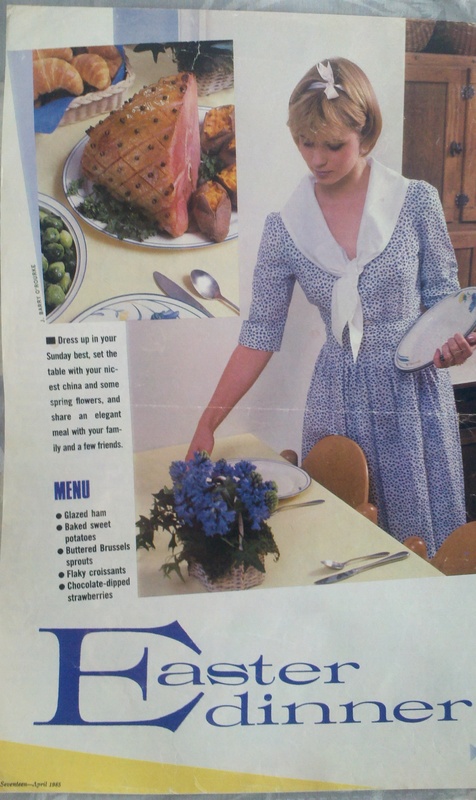 Here’s a little earlier Easter treat from 1984’s Seventeen magazine. 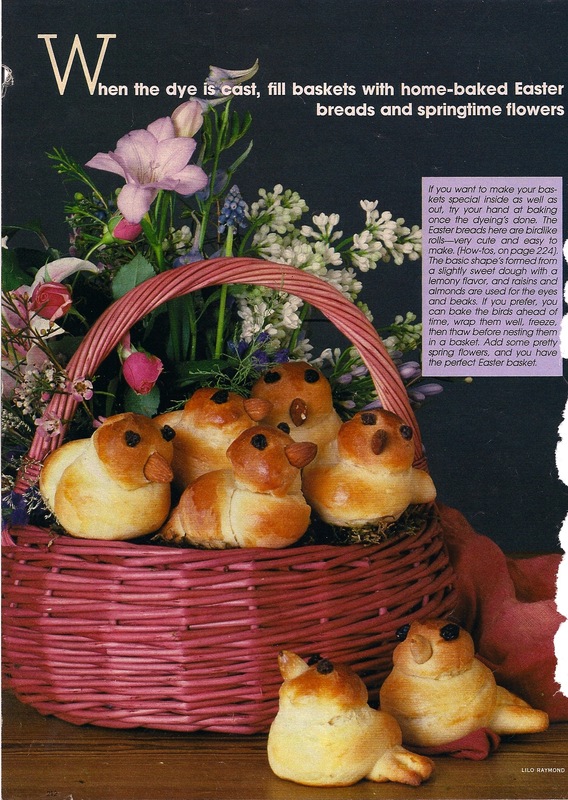 We have made these lil’ darlings a few times, and they are easier than they look.